– Innovative new housing yields a 20% smaller and lighter overall package when camera is installed in housing (waterproof to 40m). – 30% longer battery life. – 4x faster Wi-Fi for quicker transfer and playback of photos and videos from your HERO3+ camera to your mobile device when using the GoPro App. – SuperView is a new video mode that captures the world’s most immersive wide-angle perspective. – Auto Low Light mode intelligently adjusts frame rate for varying lighting conditions. – A new lens for sharper video and improved image quality. 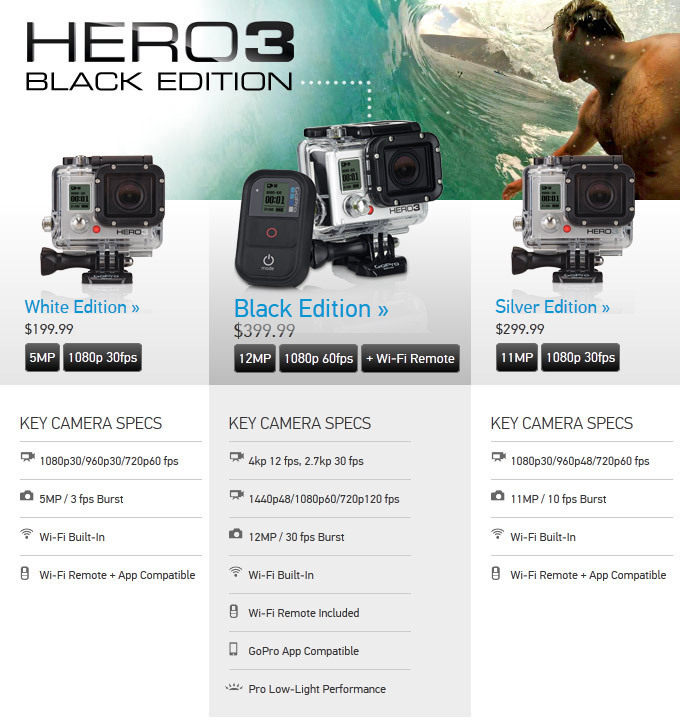 – The HERO3+ Black Edition camera has a suggested retail price of $399.99. – 2x faster image processor than the HERO3: Silver Edition. – Enables 1080p60 and 720p120 fps video. – Innovative new housing yields a 15% smaller and lighter overall package when camera is installed in housing (waterproof to 40m). 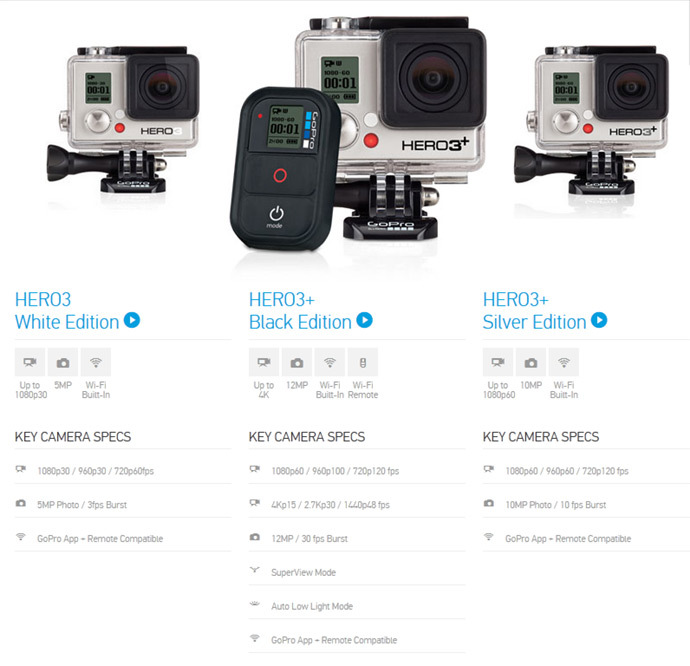 – The HERO3+ Silver Edition camera has a suggested retail price of $299.99. GoPro has just announced their new lineup of compact action camera named HD HERO3 as the successor of the previous HERO2 series. The new series consists of three models with different specifications and features, targeted respectively for different users – consumer, prosummer and professional as GoPro describes them in the form of White, Silver and Black editions of the HD HERO3 camera. The most interesting development here is that the Wi-Fi support is now a built-in feature for all HD HERO3 cameras, though you’d still need a WiFi remote for the White and Silver versions as only the Black one comes with one in the package. The specifications of the GoPro HERO3 White edition kind of remind to the ones that the original HD HERO camera had – 5MP photos and up to 1080p 30 fps video, but in the new HERO3 package, so you should still get a better quality. The White edition will not have support for the Protune software that was recently announced for the current range of HERO2 cameras and can record video with a bitrate of up to 15Mbps. The camera is expected to be available on the market starting October 22nd with a recommended price of $199 USD. The GoPro HD HERO3 Silver edition seems a lot like the HERO2 camera in terms of specifications: 11MP photos, 1080p video with up to 35Mbps using Protune, 120fps mode at WVGA resolution. So until there are some comparisons between the original HD HERO2 and the HD HERO3 Silver edition you might want to stay put with the upgrades if you already use HERO2 camera(s). Though you get the Wi-Fi module built in as an extra and that can be handy, although you’d still have to buy a wireless remote. The HD HERO3 Silver edition is also expected on the market starting October 22nd with a price of $299 USD, the same as the HERO2 cameras. The GoPro HD HERO3 Black edition is what seems to be the most interesting new addition in the HD HERO3 product lineup as it comes with the most extra features as compared to what HD HERO2 cameras already offer. The Black edition also comes with built-in Wi-Fi module and there is a remote in the package, but that is not the most interesting here. With the HD HERO3 Black edition you are apparently getting new sharper lens compared to the other two HERO3 action cameras, the resolution of the sensor is 12Mp, so up to 12 Megapixel photos and you can record up to 4K video, there is support for Protune and the maximum bitrate has been increased to 45Mbps, along with some extra features such as simultaneous photo and video recording. So everything here seems to be intended for providing better image quality and more functionality at the fingertips of the users that are interested in using GoPro HD HERO3 Black edition cameras for more professional tasks. The HD HERO3 Black edition is expected on the market starting November 14thwith a price of $399 USD, so we’ll have to wait a bit more for that one to become available. Now, regarding the 4K resolution support, though a lot of focus is being put on it, it is actually not that important and for that matter useful, considering that you have a more limited framerate when recording at 4K – 3840×2160 at 15 fps or 4096×2160 at 12fps (available only in Protune mode). On the other hand the 2.7K resolution that is also supported offers 25/30 fps at 2716×1524 or 24 fps at 2716×1440 is actually way more interesting and useful because of the normal framerates supported here (enough room for corrections and you can still get 1080p final output in 2D or 3D). Moving to the probably most used resolution, the 1080p now you have support for up to 60 fps which is a good improvement, and you can also use 48, 30, 25 or 24 fps. There is also support for a 1920×1440 mode at up to 48 fps, but that doesn’t seem that interesting, unlike for example the lower 960p resolution (1280×960) in which you can record at either 100 fps or 48 fps. Going further down the resolution to 720p you get up to 120 fps and at WVGA (848×480) the framerate is up at 240 fps, so definitely an improvement for high-speed action recording as well as for high-resolution. Mind you you’ll also need MicroSD Class 10 flash card or higher (up to 64GB supported) for using the higher bitrate and resolutions.